The northeast Paris region offers exciting and unusual activities for all ages. Parc de La Villette or the Saint-Ouen flea market are not to be missed. Come and stroll through the departmental parks of Seine-Saint-Denis or along the canals of Saint-Denis and Ourcq and participate in the various family-proposed activities! Also, hop on our enjoyable cruises from the Bassin de la Villette. Looking for more activities with children? Check out our page dedicated to them! 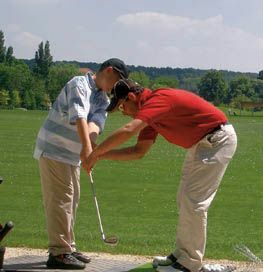 Check out the UCPA riding school in La Courneuve (Georges Valbon), play golf at Rosny-sous-Bois or at the “park de la Poudrerie”. 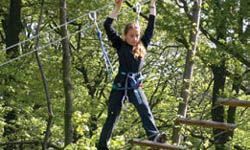 Try out the indoor climbing walls with different degrees of difficulty to make your head spin, a family leisure park Robinson Island (children) or climb up to the tops of trees in the monkey-bridge trail park “Accrobranche”. All the family will love an activity like these ones: children, teenagers and adults. Free or fee activities to do with the children, teenagers or friends! Whatever you are looking for, the Parisian Northeast region is undoubtedly the next destination for your family outings. Do not hesitate to check out our suggestions for shows and exhibitions to be enjoyed with the children! We also include tips if your are looking for activities during school holidays or activities with teenagers. Take a look at the different public holidays in France to see what will be open or not for your visit! You want to do outdoor or indoor sports ? It’s possible ! Come on and sail, observe, dream aboard a cruise boat, a canoe-kayak on the canals or why not take advantage of the sailing-club with your family. The north east Parisian region offers you all these pleasures right next to Paris. Discover Seine-Saint-Denis on foot. The Departmental Committee of Hiking has created 220 kilometers of interpretive signed nature walking trails in Seine-Saint-Denis. There are outings all year long for all levels. Take time to visit the departmental parks or walk along the canals ! Simply stroll or discover the various activities on offer. Why not relax with a picnic, or try out different sports activities such as the orienteering race and jogging. All year round, Seine-Saint-Denis and the North east Parisian region invite you to a whirlwind of parties, festivals and animations in different places and theaters. Admire the temporary exhibitions, listen to blues, jazz and world music, open your eyes wide onto the National theatre stages. The association “Savoir-faire et Découverte” invites you to discover the many and varied skills to be found in Seine-Saint-Denis and North-Eastern Paris. The Basilica of Saint-Denis is a magnificent work of architecture. A site of culture for your children who will never forget visiting the tombs of the kings of France. The Stade de France… a mythical place in constant change. You can visit the walk of fame, the changing rooms and terraces with a great view of the stadium. Air and Space Museum ! But how could they dare to fly away on machines so fragile? Planes "of paper", rockets and satellites then military planes and "Concorde". It is a fantastic and historic site on aviation as much for girls as for boys. You can go to Planet Pilote : an area for children, to understand aviation, on-hand activities from 6 to 12 years. La Villette is a huge area ! There you can find the Museum of Science and Industry: exhibitions, A Junior Space (in French "Cité des enfants") from 2 to 12 years and the Geode to be "englobed" in giant-sized documentaries they will never forget! The Cité de la Musique is an absolute must! Move towards an instrument and hear it play. There is an exhibition yearly. Enter into the Garden of Dunes and Winds "Jardin des Dunes et des Vents" ! It is a free play area for the children, outdoor and safe. An obvious detour and very successful! (closed in case of bad weather). Parc de La Villette is also a big play area for children, playing or cycling. Have a picnic in summer on the lawn and come with footballs and frisbees… Even in winter it is always pleasant to go there for a Sunday stroll (stations Vélib' Paris bikes are closed to the site). The Shoah Memorial in Drancy is a new place of remembrance in history and education. Entrance is free and open to all, this newly constructed remembrance space centre is managed by the French Shoah administration whose aim is to present the history of this camp. Alone or with your family ? Take a walk with a Greeter in North-Eastern Paris! Play area for the children ! Cité des enfants à la Villette - children 2 to 7 and Cité des enfants 5 to 12 - Junior Space !